President Obama threatened to veto the Veterans Affairs Accountability Act in a statement on Wednesday. The President called the bill "counterproductive" and said it would create "a disparity in the treatment of one group of career civil servants." President Obama's statement also said the bill would "have a significant impact on VA’s ability to retain and recruit qualified professionals and may result in a loss of qualified and capable staff to other government agencies or the private sector." "These provisions remove important rights, protections, and incentives which are available to the vast majority of federal employees in other agencies across the government and are essential to ensure that federal employees are afforded due process," the statement said. 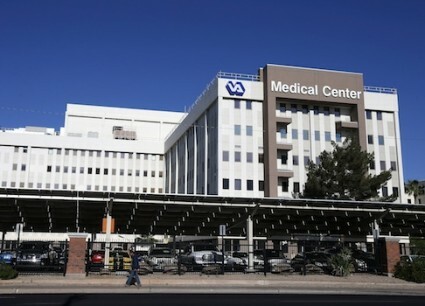 The bill would expand the VA's ability to fire incompetent or corrupt employees. It is a follow-up to the 2014 Veterans Access, Choice, and Accountability Act, which extended that ability to top executives at the agency. The new bill would go beyond just executives to lower level employees. James Freeman slammed the veto threat in the Wall Street Journal. "Perhaps the next Miller bill should instruct the executive branch that potential employees put off by the idea that they might be fired for letting a patient die while they process his paperwork are not ‘top talent,'" he said. Government unions oppose the bill, while Veterans of Foreign Wars, Iraq and Afghanistan Veterans of America, and Concerned Veterans for America support it, Government Executive reports.